Devolver and indie studio Sloclap have revealed Absolver an online combat game for PC and consoles set to release in 2017. You will play as a Prospect, who has chosen to join the Absolvers in order to maintain the stability in the fallen Adal Empire. You will wander the lands and meet other Prospects and learn new combat styles, acquire better weapons and powers and more. Details, first screens and trailer inside. 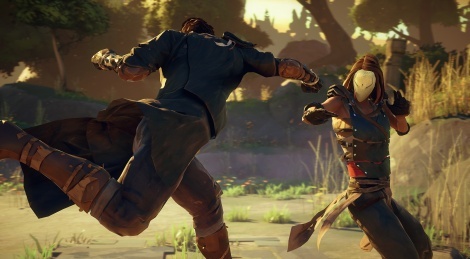 Independent developer Sloclap and amateur martial artists Devolver Digital have announced Absolver, an online combat RPG, set to arrive on PC and consoles in 2017. Absolver puts players behind the mask of a Prospect, who has taken a sacred vow and chosen to join the Absolvers, an elite corps of combatants fighting to maintain stability in the world. Monitored by the Guides, the new rulers of the fallen Adal Empire, players will wander these forsaken lands and encounter other Prospects online in order to learn their place in this world and eventually become Absolvers. Along the way, they will learn new combat styles and attacks, and acquire better weapons, powers and armor. Battles between warriors are an intense real-time flow of attacks, dodges, feints and counters, with all aspects of gameplay customizable, including combat styles, weapons and even individual attack sequences in the player's Combat Deck. Build a team of warriors to fight side by side with you in the dungeon mines of Adal (PvE) or put your skill on display in dedicated combat arenas (PvP) scattered across the land. Absolver will have hands-on demos for media and industry fancypants at E3 2016 at the Devolver Digital tailgate June 14 – 17 with gameplay set to debut on Twitch June 13 at 5:00PM Pacific (June 14 at 2:00AM CET) at twitch.tv/twitch. For more information on Absolver visit absolvergame.com and follow @Absolver on Twitter.